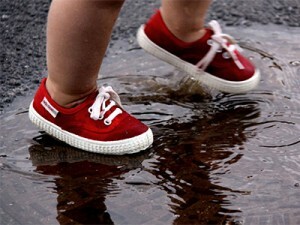 Once children are ready to walk as toddlers, their need for properly-fitted shoes is important. In general, a soft, pliable, roomy shoe, such as a sneaker, is ideal for all children. The toe box should provide enough space for growth and should be wide enough to allow the toes to wiggle. A finger’s breadth of extra length will usually allow for about three to six months’ worth of growth, though this can vary depending on your child’s age and rate of growth. Children who frequently remove shoes from their feet may be signaling some discomfort. Check your child’s feet periodically for signs of too-tight shoes, such as redness, calluses or blisters, which will help you know when they’ve outgrown their shoes. Remember that the primary purpose of shoes is to prevent injury. Shoes seldom correct children’s foot deformities or change a foot’s growth pattern. Casting, bracing, or surgery may be needed if a serious deformity is present. If you notice a problem, please contact our office to have your child’s feet examined.